The Super Soaker AquaShock Arctic Blast is the 2007 evolution of the Flash Flood (2005) by Hasbro Inc. Like Super Soaker Flash Flood, the Arctic Blast is designed with the same general set-up and functionality, featuring a bottom-mounted reservoir and a top-mounted Flood Nozzle sliding trigger. However, more than just recolouring and body styling, the Arctic Blast has a few other changes as well. The Arctic Blast features a similar nozzle set-up and activation as its older brother, the Super Soaker Flash Flood. The stream nozzle is activated by squeezing the trigger on the Arctic Shock's grip; the stream's flow seems somewhat stronger, though its output is actually lower than that of the Flash Flood. On the other hand, the Arctic Blast's Flood nozzle pushes out the contents of the firing chamber faster and more potently than the Super Soaker Flash Flood. As well, the blast from the Arctic Blast's Flood Nozzle seems to be slightly more coherent, perhaps offering slightly better range (range testing still to be done). Both nozzles are powered from the same CPS-based pressure chamber located directly behind the nozzles. The pressure chamber is somewhat smaller than that of the Super Soaker Flash Flood, but still provides a good amount of power and yield. The Arctic Blast's pump is a standard forward-mounted pump, but features a smaller, oddly-shaped grip. 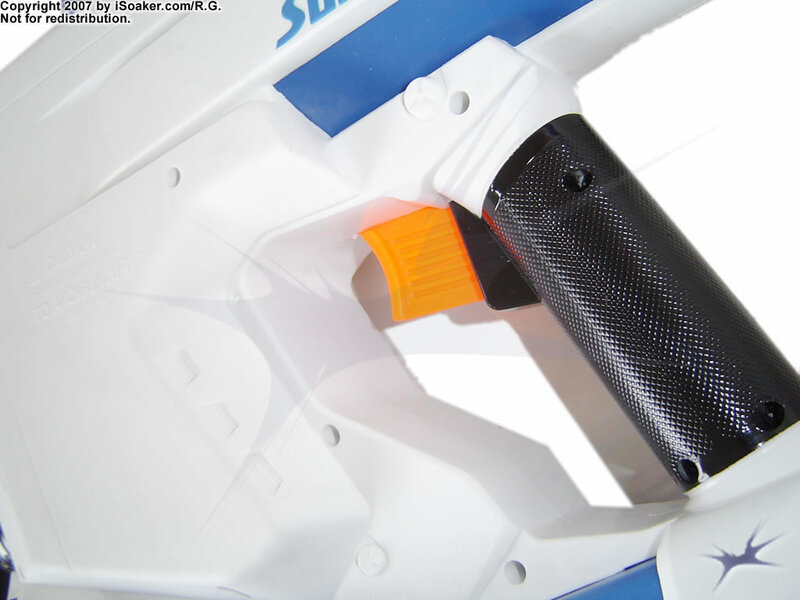 Due to the grip's size and shape, holding it is somewhat awkward and while pushing the pump in is facilitated by the larger front surface area, the overall grip motion is less comfortable than the traditional longer-style pump grip. Some may like the shortened style, though it would be more awkward to use for those with larger hands. Perhaps a shortened grip was chosen to reduce the chance of the pump rod being snapped in the event the blaster is dropped. The pump, unfortunately, does not pump that much water per stroke, meaning it does take a fair number of pumps to fill the pressure chamber. Additionally, it seems difficult to tell when the pressure chamber is filled as the overfill valve is quieter and there is no fill gauge or fill window. The stream nozzle trigger is mounted in the standard position on the Arctic Blast's grip. The grip area offers a good amount of room and should be able to accomodate all but those with massive hands. The trigger, itself, pulls the Max-D-style nozzle valve well and feels rather sturdy. 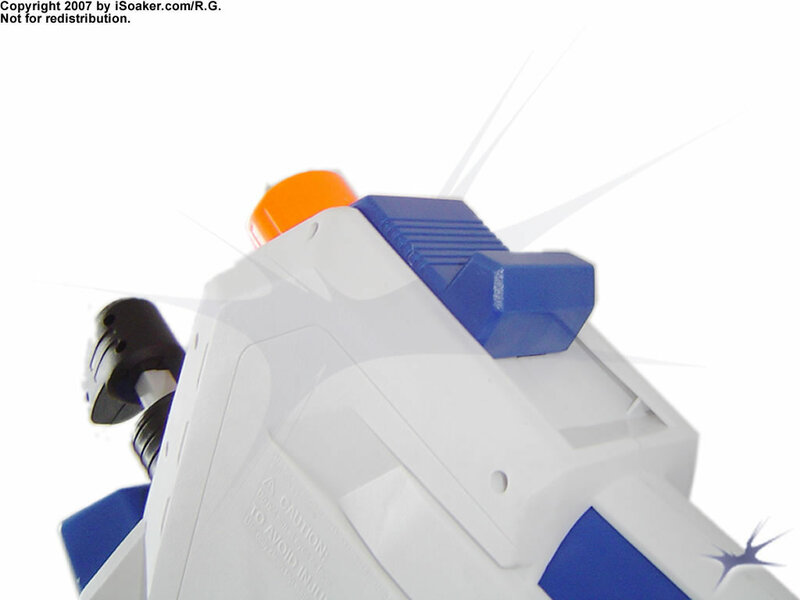 Atop the blaster, the Flood Nozzle trigger slides back to open the large Max-D Flood Nozzle. The Arctic Blast's Flood Nozzle trigger feels sturdier and better guided than that of the Super Soaker Flash Flood. Due to its top placement, the Flood Nozzle trigger requires both hands to operate easily, preventing one from pumping while this nozzle is open. The reservoir on the Arctic Blast is located in the large blue region at the bottom of the blaster. The advantage to this is that it lowers the overall center of gravity on the blaster, particularly when the reservoir is full. As a result, like the Super Soaker Flash Flood, the Arctic Blast is well balanced. Unfortunately, being on the bottom, the intake tube is longer and causes a little bit of excess resistance when pumping. 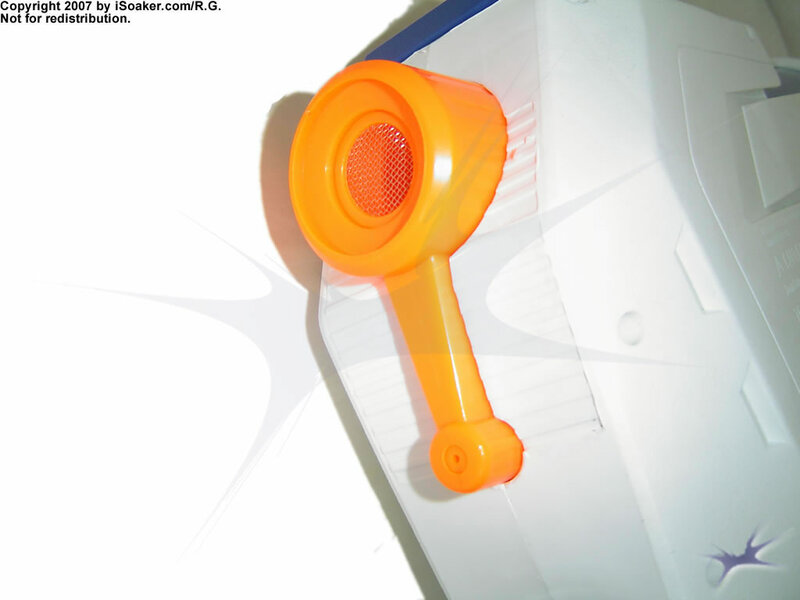 Due to the intake tube's placement, it is also difficult to make use of all the water in the reservoir. The reservoir, itself, holds a respectable amount of water, though it would not have been hard for Hasbro Inc. to have increased its size. Then again, the reservoir also features a large fast-fill cap that has an adaptor the the Super Soaker Aqua Pak reservoir extension backpacks. The Arctic Blast's name is derived from the fact that the reservoir cap is larger than normal to allow the insertion of ice-cubes into the reservoir. Ice would undoubtedly reduce the amount of available liquid water, but its chilling effect may be worth it for some. 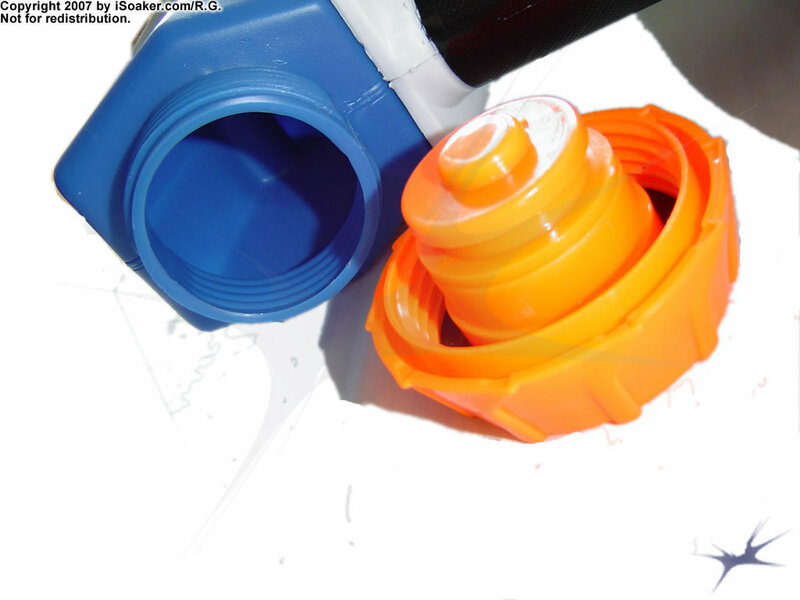 The cap is backwards threaded which allows it to function with the Super Soaker Aqua Pak accessories, but is counter-intuitive for most right-handed individuals. As a whole, the Super Soaker Arctic Blast would make a welcome addition to most users' armouries. It is a good high-powered light soaker; its main nozzle provides a good, solid stream while the Flood nozzle can provide an added drenching blaster of water should the opportunity arise. Add to this the flexibility to extend reservoir capacity using a Super Soaker Aqua Pak as well as adding in ice to the mix and one has a rather flexible water blaster. 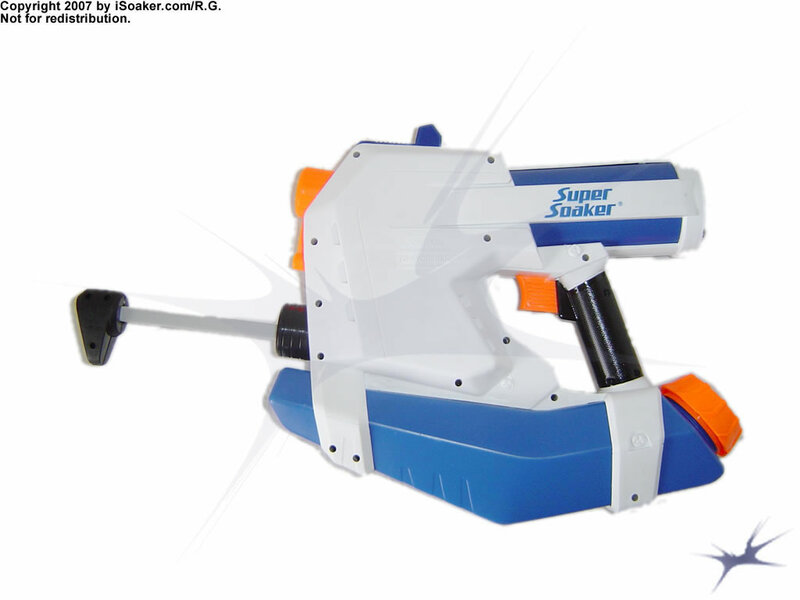 While not recommended when facing CPS1500 or larger blaster users, this soaker can definitely hold its own in the majority of water fights out there. Very comfortable and well-balanced. Good reservoir to firing chamber ratio. Solid main stream and particularly potent Flood blast nozzle when pressurized. Pump grip rather short, making it awkward to use at times. Main nozzle on the smaller side. Grip area may be limiting if one has particularly large hands. No pressure gauge or reservoir level indicators. No strap or clip making it hard to use an additional blaster simultaneously or as back-up. The Arctic Blast is a sturdy water gun which, when taken care of properly, should last for a while. The reservoir can take a fair amount of water, although not every last drop can be used due to the shape of it. The Flash Flood trigger, although situated at the top of the gun meaning two hand are needed, feels good when used and gives you that small amount of resistance which gives a satisfactory feel, the same can be said for the primary trigger. A strap would have done nicely as a backup soaker could have been used. The Arctic Blast is compatible with the Max Infusion Backpack which is good for those people who are just a little to trigger happy. The pump is a good shape for those who have smaller hands like me and seems durable. There hasn't been too many problems with leakages with the Arctic Blast although I found that after much pumping, out of the Flash Flood nozzle will come a small trickle of water and a small hissing sound can be heard. After further inspection, I noticed a small hole in the nozzle purposely made to prevent the pressure chamber from being damaged when the Water Gun is being pumped. I think that the Arctic Blast is one of the better super soakers that Hasbro has produced recently and can definately fare well against most water guns under CPS 1000 standard. If you manage to find the Arctic Blast for a good price or you just don't want to pay that much for a super soaker, I recommend getting the Arctic Blast. This summer i decided to buy the new Artic Blast water gun from the local toy store.So far the water gun seems durabile and looks like it will last a long time. The main nozzle has ok range and a not so great output. The flash flood nozzle is your main weapon, when fully pumped it will completely soak the target. Water capacity on the water gun is ok, but I would recommend buying the water pack with it for a extra 10 dollars. The pump is the worst part of the water gun. It has a small handle and takes a long time to get to max pressure. Over all I rate this water gun 8/10. It is best suited to hit and run attacks and will be able to take on all prestent day blasters.